commented on "Banquette & Diner Booth Seats for Home with Storage custom made in South East Melbourne"
JARO can help you design that special look for your venue whether it is bright and colourful or more traditional. 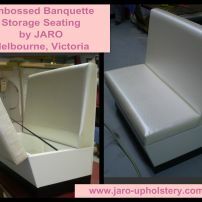 For further information email enquiries@jaro-upholstery.com.au or contact Jason on 0402 188238. Pictures and plans can be emailed also.